Camille Cosby clearly didn’t like the hot seat. The wife of embattled comedian Bill Cosby comes off as doggedly tight-lipped and defensive in a 15-page snapshot of her recent deposition in a libel lawsuit brought by seven accusers. The excerpt was released by Cosby’s lawyers Tuesday as they try to convince a judge that the civil lawsuit should be put on hold pending his felony prosecution in Pennsylvania. It focuses on several exchanges between Camille and plaintiff’s lawyer Joseph Cammarata in a Springfield, Mass., hotel on Feb. 22. The two spar repeatedly over her knowledge of the Andrea Constand case that underpins Cosby’s pending felony charges. Constand’s accusations that Cosby drugged and sexually assaulted her at his suburban Philadelphia mansion in 2004 are the basis for the criminal charges filed Dec. 30 against Cosby in Montgomery County. Camille Cosby claimed under questioning by Cammarata that she never read the civil complaint Constand filed against Cosby in 2005. She testified that the only details she knew about the case came directly from her husband and a lawyer. “I don’t remember,” she answered repeatedly when asked for details on when and where she heard about the case. She said she was aware her husband was deposed a decade ago but declined to give specifics on whether the couple discussed the testimony. Sections of Cosby’s Constand depositions that were released last year revealed he admitted under oath that he obtained Quaaludes to give to women he found sexually attractive. “Have you discussed your husband’s deposition testimony with your husband?” Cammarata asked Camille Cosby. “I don’t want to answer that,” she replied. “Well, you can’t not,” Cammarata said. “That is communication between me and my husband,” she shot back. “Okay. Well, you don’t get that privilege to just tell me … that you’re not going to answer,” the lawyer replied. “All right, but I am telling you that that is communication between my husband and me,” she said, again claiming a marital privilege. Cammarata told her he wasn’t asking for the “substance” of the conversation, just whether they discussed the prior deposition testimony. 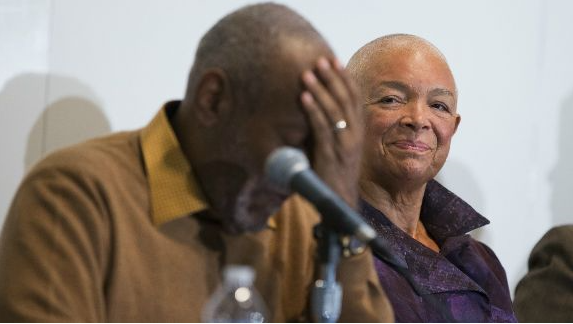 “That is just communication between my husband and me,” Camille Cosby said again, digging in her heels. One of her lawyers then instructed Cosby’s longtime wife that she should answer yes or no. “Yes,” she then replied, before saying she couldn’t remember when the conversation took place. The underlying Massachusetts lawsuit was brought by accuser Tamara Green in late 2014 and now includes plaintiffs Therese Serignese, Linda Traitz, Louisa Moritz, Barbara Bowman, Joan Tarshis and Angela Leslie. The women claim Cosby sexually assaulted them decades ago and then defamed them by calling them liars when they stepped forward. The deposition excerpt released Tuesday shows Camille Cosby was represented by four lawyers at her grilling. Bill Cosby wants the case put on ice, saying he can’t adequately defend himself if he has to assert his Fifth Amendment privilege to protect himself during the felony prosecution. Camille is standing by her lying, drugging and sexually abusive husband. Word on the street if you want to know how he gained access to the drugs utilized in said abuse they say it was her hand that wrote the prescriptions. Hmmm makes you wonder what type of sick, twisted marriage they actually have.